This is a book about everywhere between Tewkesbury and Bala and Chester to Newport - in other words, every bit of Wales with the exception of the west coast and the extreme southwest, with a good chunk of England thrown in for good luck. 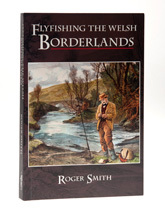 One of the frustrating things about Wales is that access was difficult prior to the middle of the eighteenth century and although it seems that fly fishing has a long history there, there is no getting around the fact references are strongly biased to the English side of the border prior to the twentieth century, but Roger gives an excellent summary of what little is known in the first chapter. The second chapter sets the scene in a series of personal accounts of fly fishing in the Borders written by different local experts and this is followed by the meat of the book, a chunky 128 page section devoted to trout and grayling fly patterns used in the region. Many of these are sourced from Moc Morgan's Fly Patterns for the Rivers and Lakes of Wales and from Michael Leighton's Trout Flies of Shropshire and the Welsh Borderlands, but there are plenty from elsewhere and you also get twenty one pages of illustrations into the bargain. The dressings run from the earliest known Border dressings published by Bowlker in about 1746, all the way up to contemporary patterns, and given that there are over 200 listed, this is the only book you are ever going to need if you plan to fish in the area. Where possible, the name of the insect the pattern is supposed to imitate is given and Roger also includes notes on using the flies and even on the inventors, so there is plenty of interest. Chapter four covers regional adaptations of dressings, over five pages - the illustrations of the head-and-shoulder hackled fly and the reverse-hackled pattern have unfortunately been transposed, but this is so obvious that it shouldn't lead any readers down the garden path. The hundred pages which follow deal with regional angling literature; here Roger casts his net pretty wide, including just about every volume that so much as mentions the area, but you get a valuable summary of each book, with, as an added attraction, the complete text of Reverend Powell's chapter from the Mansfield's oddball 1957 omnibus The Art of Angling, a piece which provides a useful summary of dry fly fishing on rain-fed rivers. The remaining chapters in Flyfishing the Welsh Borderlands are a mixed bag which includes "A poetic view of the region"; a taster just over twenty pages long on where to fish today; and a bibliography. Short of someone sitting down and writing a beat by beat resume of the region we are unlikely to see anything better on the subject published in our lifetimes. Thirty copies will be made available in a limited edition published under the Flyfisher's Classic Library imprint, the standard edition being a pleasingly chunky paperback with good quality laminated covers.